I finally spend my birthday money this month! Thanks to my husband, parents, and parents-in-law for pitching in! The problem is, I don’t really know what I’m doing. I am definitely a beginner. I think this will be a good machine for me – I need to learn what I am doing before I get a fancy one. I bought a pattern for a bag that said “Beginner” on it, and I just went for it. It may have been written for beginners, but it wasn’t written for blonds. ha ha. But, I made it through it. I made several mistakes, but for my first project, I didn’t think it turned out too bad. I had a lot of fun making it, and that’s what counts, right? And I learned a ton – and that was the point. What are some beginner projects you have done? I’d appreciate any and all tips and advice! I’ll be the first to admit….I’m not a seamstress. In fact, I didn’t even do well on the sewing part of Home Ec either! No pattern needed. I just hemmed and made one seam down the back. You just measure your bust (I’ll not be telling you what mine was! Ha ha!) and add one inch. Then I added some ribbon (burnt on both ends so it doesn’t fray) and Voila! A Very Cute Dress! So what do you think? Ready to try it? You should totally go for it! The fabric cost $11.47 per yard at Walmart and $.55 per inch at JoAnn’s. So I got the whole dress for just over 12 bucks! Not too shabby! And just for fun, these are my favorite kids in their Easter clothes! Next to quilts and table runners, I love making curtains! I wish I had pictures of all the curtains I’ve made over the years, it would be so funny to look back. 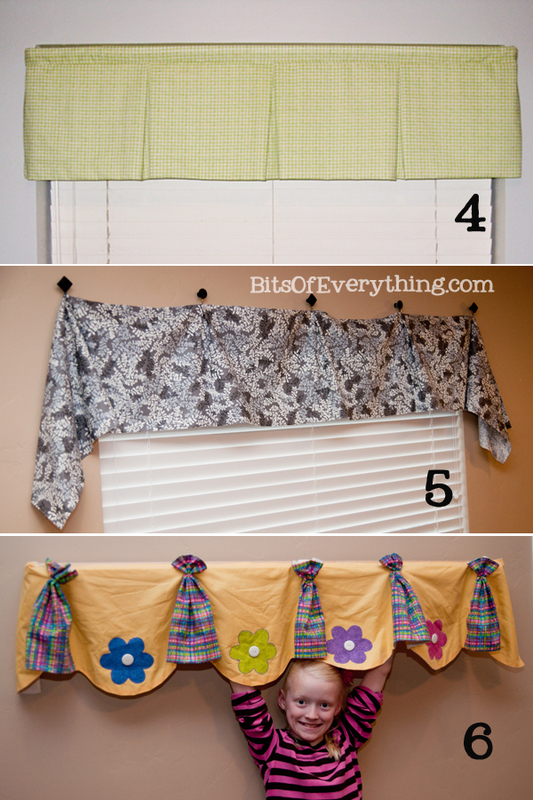 Here are just a few simple ideas for cute valances. 1 – Denim (Raggy) – I love how simple this valance is – no hemming involved! Made from my denim stash and hung on a regular (cheap) rod. In my old house, these hung in the laundry room, but now they are in my boy’s room. They go perfect with their denim quilts I made them. 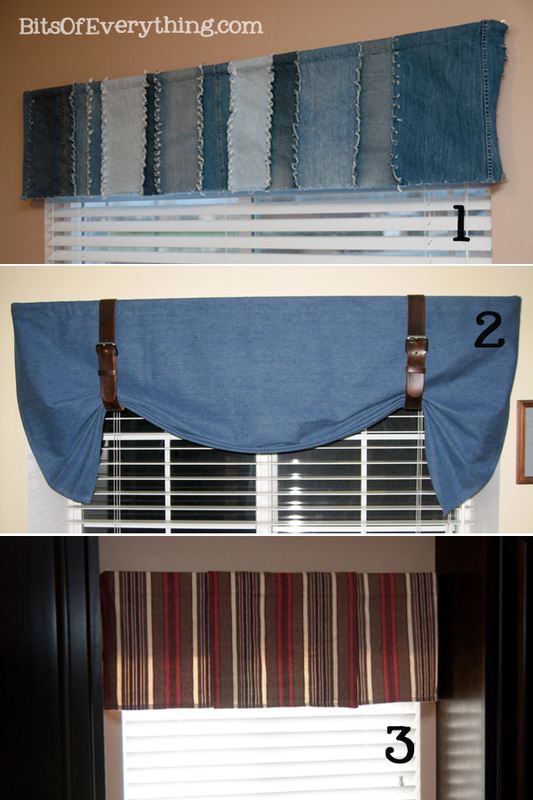 2 – Denim (with belts) – These are the new curtains in my mom’s family room. They have a rustic feel to their room and these simple denim valances are perfect. My dad even made the belts to hold them up. Impressive. This valance is a simple hem on all four sides, with a rod pocket on the top. Nothing fancy, but so fun. 3 – Towels or placemats – This valance gets the prize for the ultimate easiest valance ever! I found these towels that matched my colors in my kitchen perfect. I seriously just hung them over the top of a regular cheap rod and I was done. No sewing involved! I used 3 towels. 4 – Simple Pleats on regular rod – I made this quick valance for the guest room at my mom’s house. It has 3 simple pleats in it to add some body. After I hemmed the 3 edges and pinned the pleats in place, I attached the rod pocket. Done! Simple, but so cute to add a little green in her grey room. So fun. 5 – Hanging from hooks – This is the valance that I have been dreaming up for my new house family room. I wanted to do something different than I have done before. So, I had Brian install 5 knobs above my window for me. Then I took my big long rectangle of fabric and hemmed the edges. Then, I made a little pleat and added a loop of ribbon across the top to hang it from. I’m loving the pattern with the hooks, but I’m not loving the fabric. I think it’s a little too busy for me. We’ll see if it sticks. 6 – Old curtains on board – I found some old curtains to show you. You can tell by all the wrinkles that they have been in storage for a while now. These curtains were one of my first sewing projects. I made them at my sewing lessons. They used to hang in Kaylee’s room when she was 3-4 years old. I even made a quilt for her bed that matched. (I was very ambitious back then!) The cool part about these curtains are they are mounted on a board with tacks – no rod pocket. Then, we mounted the board above the window using some L brackets. It worked perfectly and I have used that method of hanging curtains several times since then. – When measuring for fabric, remember to include 2 inches on each side for your returns. (The part of the rod that curves back to meet the wall.) Also add in at least 1 more inch for your hems or seams. – Use scrap fabric to practice on. If you are unsure – try it out on some cheaper muslin to see if it’s what you are looking for. It gets expensive to replace the fabric that you cut wrong. – I don’t know of a rule for how long valances are supposed to be, but mine usually end up being 12 to 16 inches tall. – Sometimes I hang my valances several inches higher than the window. This way it blocks less light and makes your windows look taller. Valances are so easy to make, you don’t even need a pattern. I’ve never used a pattern to make any of my curtains. You can do it! Give it a try. I would love to see what you make.